The "Take It!" 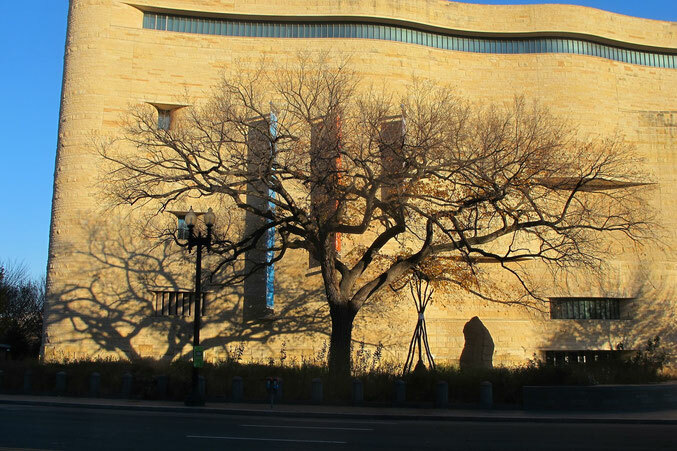 came from yet another drive by this magnificent Tree and finding the sun at just the right place to offer up a shadow on the side of the building that captures just about as much as it can of the tree as it stands in the foreground. The After Take: I have shown this photo to several and all seem to be quite impressed with the simplicity that it represents and yet upon looking at it for not that long a time - many details make themselves known. We chose to make this photo the banner for Winter 2014, as well as a smaller version, the front of the business cards. I hope you will enjoy looking at this magnificent tree as we go through this season with all its splendors. PS: I will admit to being ever so attracted to this tree. It is complex in its branch configuration with their many twists and turns - but simple, as it all comes together, as this photo so easily shows. That looks like it would make a great business card. The shadows in the picture look really awesome. Perfect angle! Sure fire sign that its winter. That is such a wonderful museum. I have mentioned this before but our school takes the 8th grade class to DC every year and I am one of the chaperons. While we haven't been in that museum in the last few trips, I do have very fond memories of it. Teri and I used to take our 8th graders in there every year. Great educational building. Great picture!!! Looks cold!